Place cauliflower crumbs in a large microwave-safe bowl; cover and microwave for 2 minutes. Uncover and stir. Re-cover and microwave for another 2 minutes, or until hot and soft. Return cauliflower crumbs to the large bowl. Add all remaining ingredients except seasoning and egg whites/substitute. Thoroughly mix. Fold in 1 tsp. seasoning. Evenly form into 18 balls (about 1 1/2 tbsp. each), and place on the baking sheet, evenly spaced. Brush the tops with egg whites/substitute. Evenly sprinkle with remaining 2 tsp. seasoning. Hungry for More Savory Baked Goods? It's National Potato Chip Day, March 14th! Celebrate in baked-not-fried fashion with Kettle Brand Baked Potato Chips. Hickory Honey Barbecue, anyone? 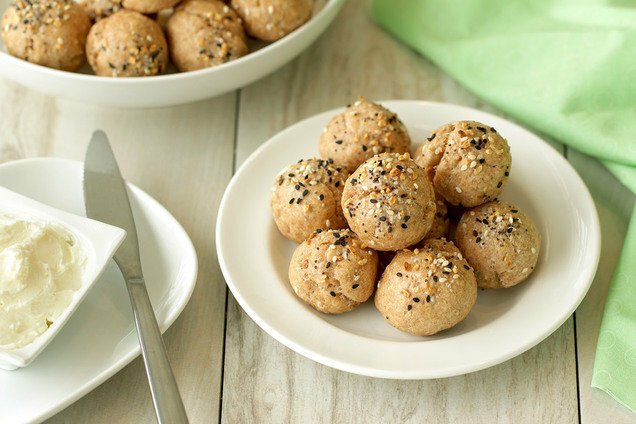 Share this recipe now, and you won't have to share your bagel bites later... Click "Send to a Friend" stat!